Every year, Oxfam releases a report meant to shock the public about the extent of income and wealth inequality. This year’s report claims that the eight richest people on Earth have as much wealth as the bottom half of the world’s population (3.6 out of 7.2 billion people). That’s certainly shocking. It’s also profoundly misleading. As others have pointed out, Oxfam reached that number with a questionable methodology, which also led them to several other absurd conclusions. 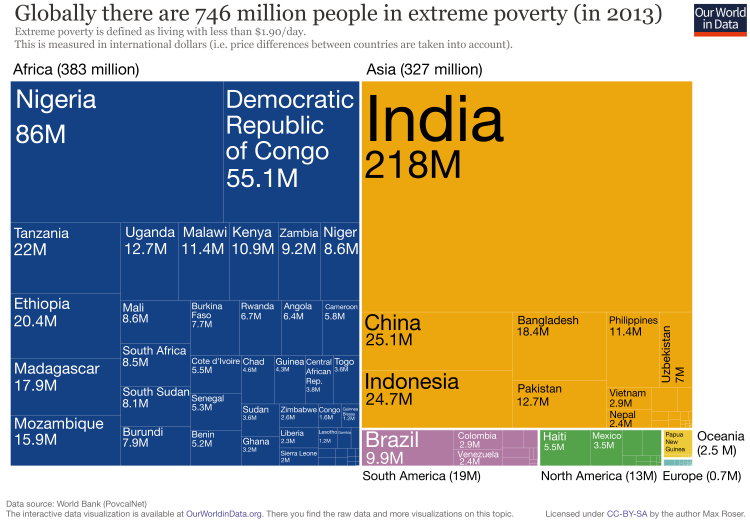 According to their own graphs, more poor people live in North America and Europe than China (see the far left of the chart below). How can that be, given that traditional poverty measures show the opposite? Oxfam isn’t using a traditional poverty measure (such as the number of people with a purchasing-power-adjusted income of less than, say, $2 per day). Instead, they focus on something called “net wealth.” This is the sum of an individual’s wealth minus any debts. Of course, many people in rich countries carry debt due to university loans or a home mortgage, yet also enjoy high incomes and an enviable standard of living. Here are some illustrations of just how absurd it is to use net wealth as a measure of poverty. Consider this. Oxfam claims a penniless, starving man in rural Asia or Sub-Saharan Africa is far richer than an American university graduate with student debt but a high-paying office job, a $2,000 laptop and a penchant for drinking $8 designer coffees. (I must credit Cato’s Adam Bates for that example). Here is another example, courtesy of Johan Norberg. He points out that his daughter, a child with only about twenty dollars in her piggy bank, is richer than 2 billion people by Oxfam’s logic. If that were true, then the solution would surely not be to take away the humble savings of his daughter and redistribute them among those 2 billion souls, but rather to generate more total wealth, “enlarging the pie” so to speak. That’s the core problem with obsessing over “inequality.” If the goal is to further human wellbeing, then instead of decreasing inequality through redistribution, we should focus on decreasing poverty by creating ever more wealth. Happily, thanks to the wealth-creating power of market exchange, we’re doing just that. The trend lines all show that poverty (by any reasonable measure) is in retreat. NPR had a story this morning on “social inequalities and growing discontent in El Salvador.” Relying exclusively on anecdotal evidence, the story was full of mischaracterizations about the economic and social reality of that country. …whichever candidate wins, he faces a faltering economy, entrenched poverty, rampant crime and a population that’s still recovering from a civil war. Granted, rampant crime is a major problem—unfortunately El Salvador is the most violent country in the world—but a faltering economy? NPR didn’t provide any evidence aside from anecdotes. Actually, El Salvador has made enormous progress thanks to an aggressive agenda of market reforms. Once you account for revised population data due to a new census, El Salvador’s per capita GDP has grown by 3.3 percent since 1992—the third highest rate in Latin America during this period, after the Dominican Republic (3.8) and Chile (3.6). And as I point out in my new paper on El Salvador, there is ample evidence that official figures significantly underestimate the performance of the economy, mostly because the service sector—an area in which El Salvador leads the region—is grossly undervalued in the country’s estimation of GDP. The economy is probably more than 30 percent larger than indicated by the official data. Thus the average per capita growth rate since 1992 has been approximately 5.2 percent per year. Entrenched poverty? Since the end of the civil war in 1992, the number of households below the poverty line has diminished by more than 25 percentage points. Extreme poverty has also declined by almost 18 percentage points. During the first decade of the market reforms, net enrollment in primary education increased by close to 10 percentage points, infant mortality declined by 40 percent, and the population without access to safe water was halved. Yes, almost 35 percent of Salvadoran households still live in poverty, but by any indicator, poverty is in retreat. One of the most telling facts about how tough life is in El Salvador right now is that a quarter of its population chooses not to live here. An estimated 2 million Salvadorans out of a population of less than 7 million live and work in the United States. It is true that approximately 2 million live outside, but the bulk of Salvadorans who immigrated to the U.S. left during the period of civil conflict. Immigration has certainly continued, but presenting it in its entirety as a sign of economic hardship, as NPR correspondent Jason Beaubien does, is misleading. El Salvador has moved aggressively under the conservative Nationalist Republican Alliance, or ARENA party, to align its economy with the U.S. In 2001, it adopted the U.S. dollar as its sole currency, and in 2006, it ratified a free-trade deal with the United States. The trade agreement led to a modest boost in exports, but in the market, shoppers and shopkeepers say it hasn’t helped them. How does adopting free market reforms constitute an effort to “align” the economy to the U.S.? By liberalizing their economy, Salvadorans authorities are protecting the cash value of pensions and salaries, lowering interest rates, have incentivized savings, and provided modern and affordable public services, etc. Their goal was to make the Salvadoran economy more dynamic and competitive, not to “align” it to the U.S.
Also, the increase in exports since CAFTA was implemented three years ago has been anything but “modest.” Exports were 34 percent higher last year than in 2005, the year before CAFTA went into effect. From 1991 to 2007 El Salvador had the highest export growth rate in all Latin America. This is not to say that there aren’t serious challenges facing El Salvador. As I said earlier, crime is the most serious of all, and the main source of popular discontent in the country. The country is feeling the consequences of the global economic downturn, as are most developing countries. But the way that NPR presents life in El Salvador demands a serious reality check.